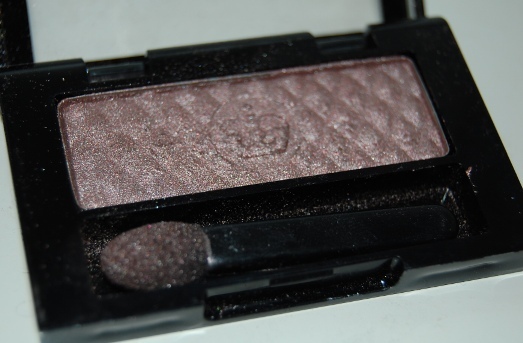 Although at a glance this eyeshadow may not look like the most interesting (or to be honest the most loved) of cosmetics. I inherited this from my Mum who is exceptionally pale and actually found it too dark. 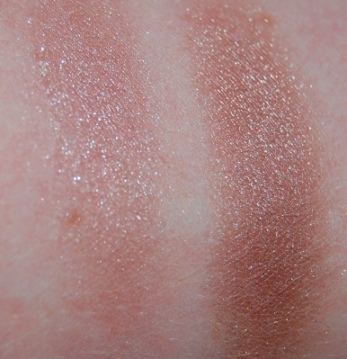 However, on me I think that shade 130 'Tribute' is a perfect taupe crease colour! Despite dustiness, I think this shade provides something that I've rarely had at my disposal - a gorgeous substitute for brown. Cosmetics in chocolatey shades show up as seriously dark on me and take a lot of blending! Even paler browns seem to just look quite wrong so I tend to favour shimmery gold shadows. Fortunately, Rimmel have found a pretty balance between the two that applies and blends very easily. Yes the shadow is rather dusty in the pan, but take a look at that shade! On the back of the packaging Rimmel add that this shade complements both blue and green eyes. Upon recent application and inspection I can agree that it does actually bring out green shades in my eyes. The rather dusky gold shimmer has always seemed to me to be a brown with lilac undertones, setting it apart from several other red based golds that I have. A light application gives a subtle gold shimmer covering and heavier application can be blended easily for a smokier look. The consistency isn't as soft as some I've come across and it isn't overpoweringly metallic. I find it is a lovely neutral with just the right amount of shimmer. While the wear is quite average I find it depends on blending and eyeshadow combinations. When worn alone I've experienced some annoying creasing but no more than when I wear some of my Accessorize shades which are far softer. Finally a pair of swatches for your delectation. On the left is a very light sweep and on the right is a built up application. The left clearly shows the shimmer which is very fine and very pretty. On the right I think is where the shade shows its substance and gives some colour payoff. While it isn't particularly dramatic I think this shade is definitely a go-to colour that I'm glad to own! 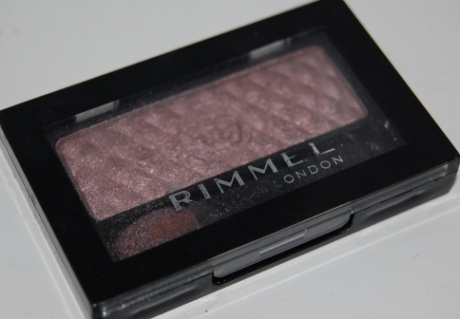 Rimmel mono eyeshadows normally retail at £4.49 and are very widely available. Considering this fell into my lap for free I think I can call that a very happy accident!